Hand pedicure by Dr. Fish! Since 2006 a very unusual hand & foot therapy has become available at various Spa centers in the world, named: 'Dr fish'. Doctor fish is the name given to two species of fish: Garra rufa and Cyprinion macrostomus fish species - both are like combfishes in that they only consume the affected and dead areas of the skin, leaving the healthy skin to grow, with the outdoor location of the treatment bringing beneficial effects. So, basically - 'Dr. fish' is sort of a very unusual pedicure treatment. The 'Dr. Fish therapy' became especially a popular treatment - though formally: this spa treatment is not meant as a curative treatment option, only as a temporary alleviation of symptoms, and patients usually revisit the spas every few months. Some patients have experienced complete cure of psoriasis after repeated treatments, but due to the unpredictable nature of the disease, which is strongly influenced by endogenous factors, this may simply be regression towards the mean. Re: Hand pedicure by Dr. Fish! I have heard about this fish cure for psoriasis many times in Turkey (since before 2006). Earlier this week I was informed that the first 'fish treatment' will come available in the Netherlands as well in 2011. I noticed that it's already available in your country. Looks like these fishes are an 'easy catch'! This is the famous spa in Turkey, Balikli Thermal Springs at Kangal, Sivas. Thanks for the link Lynn. I love that evolution animation too, tho in some ways it gives me the creeps. In Turkey I have experienced these fish who nibble your dead skin (not at the spa, in the sea somewhere). It is a very strange sensation, not unpleasant unless they nip you a bit too hard! Leaves your skin lovely & smooth! Turkey is very good at these kind of natural remedies for health problems. Apart from the fish remedy, you can de-tox your skin in the various lovely healing hot springs/spa waters, or the mud-baths, or the hamams (Turkish bath/massage). Thanks for sharing this quote Lynn! By the way, the last few words (... remission time...) illustrate that the report doesn't claim that one can speak of a truely lasting 'cure'. "The reported mean remission period was 8.58 months"
Yes of course, the fish are just treating the outer symptom, not the root cause. Which is what allopathic medicine usually does. 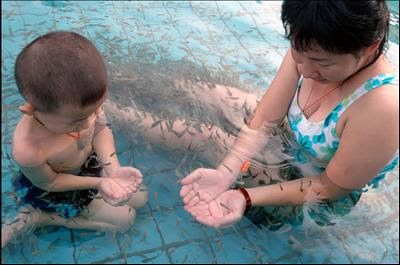 Many people visit these fish spas in desperation after years of being unsuccessfully treated by conventional medicine. At least the fish treatment provides some remission and is more natural than pharmaceutical creams & medicines.